Libby's Little Addiction: Post-Memorial Day Food Coma! I don't know about you, but this is how I felt yesterday! We had a nice little cookout here with family - although ours involved smoked chicken, not hamburgers. But I didn't have a smoked chicken stamp. 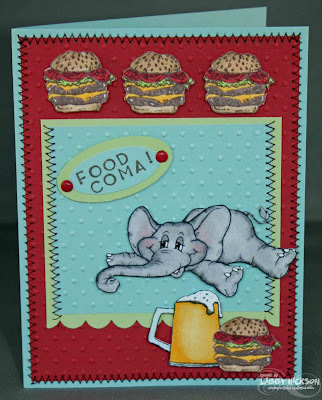 :-) I made this card to play along with two of the card challenges on the Stampin' Out Alzheimers site. Have you checked it out yet? I'm telling you - you should!! It only takes a small donation to an important cause to get into the site. They have done such a fabulous job!! Already lots of freebies, challenges and giveaways happening!! So exciting!! For this card I used my cute little Our Craft Lounge elephant. Sprawled out like that, he just looks to me like he's over-indulged in hamburgers! (not to mention a brewsky or two!) The beer mug is from Flourishes, and the fun hamburger stamp is from Hambo Stamps. I spelled out the sentiment with some Stampin' Up peg alphabet stamps (which one exactly I am forgetting at the moment...!). One of the challenges I played was to STITCH on a card. *snort* A no-brainer for me, I do it all the time. I feel like such a cheat when I claim to be playing a challenge like that. But hey, they are offering a prize! So sssh... don't tell that I do it all the time, ok?? I also played a Color Throwdown challenge from a few weeks back - Riding Hood Red, Baja Breeze & Certainly Celery. I hope you all had a wonderful weekend and are easing back into the daily grind ok. I have a ton of stamping to do this week, yikes! I'm going to a huge SCS shoebox swap in north Dallas on Saturday, and I haven't even designed my card yet, much less cut out the nearly 50 kits needed for the swap. Someday I will learn not to procrastinate...!! Thanks for stopping by today!! I love how you used those colors, Libby! I feel exactly like that little guy sometimes!! Mmmmmm...I wish I was having burgers for dinner now! Wow...I can really relate to this card HA! Cute and funny, Libby -- just like you! I love how you put all these stamps together to tell a story. I didn't go into a food coma from the weekend, but I sure didn't waste any time getting back into the daily grind. Hope you enjoyed your shoebox swap day! CUTE! LOVE all those hamburgers! this card cracks me up! I certainly know the food coma at times LOL! What a fun play on that.